In the world of travel, timing is everything. It determines all sorts of things, from how much you’ll pay to how smoothly your trip will go. With that in mind, we bring you these nine tips for perfect travel timing every step of the way, from booking your flight to checking in at your hotel. On Which Day of the Week Should I Fly to Get the Best Prices? If you've ever done a flexible airfare search, you know just how dramatically fares vary based on the day of the week. Choose your days wisely and you can save hundreds of dollars. According to FareCompare's Summer Vacation Flight Guide, Tuesdays, Wednesdays, and Saturdays are the least-popular travel days for domestic flights. For Europe flights, seats are in lower demand on Mondays, Tuesdays, and Wednesdays. So if you're looking for a deal, you might find that flying on these lower-demand days means better prices for you. How Far in Advance Should I Book to Get the Best Prices? The best way to secure a good airfare is to aim for that Goldilocks sweet spot of booking not too early and not too late. FareCompare cautions against booking more than three and a half months out, explaining that "airlines don't begin actively 'managing' prices until three or four months before departure, and if you buy any earlier than that, chances are good you'll pay too much." But don't wait too long: Since airfare prices tend to rise sharply up to 21 days in advance of departure, you'll likely end up paying too much if you wait until the last minute. For more route-specific advice, Momondo's brand-new Flight Insight tool offers detailed suggestions about when to book, which airport to fly into, and which airline has the cheapest fares. So far, the tool is only available on 400 routes, a fairly limited number given how many flights there are in the world, but it can be handy if your route is profiled. When it's available, the Flight Insight tool pops up next to the "Price Calendar" and "Best Fit Flights" tabs on airfare search-results pages. On Which Day of the Week Should I Book to Get the Best Prices? If you're trying to get the best airfare, when you book can make as big a difference as when you fly. The results of a recent FareCompare study offer some very specific advice: For domestic airline tickets, the best time to buy is Tuesday at 3 p.m. ET. The study also cautions against booking on Saturday or Sunday, since airlines tend to pull discounted airfares in advance of the weekend. How Long Should Connection Times Be Between Flights? Trying to make a tight connection between flights is a surefire way to add unnecessary stress (and a possible missed flight) to your journey. And you can't always count on airlines for guidance; their recommended connection-time minimums often leave frequent travelers wondering how anyone could possibly get to another flight in the suggested amount of time. 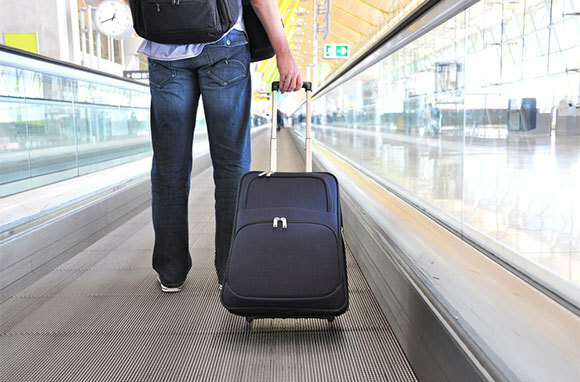 The amount of time you should allow between connecting flights varies depending on the airport, the airline, and whether or not you'll have to clear customs or go through security to switch terminals. As a general rule of thumb, it's safe to assume that, on domestic connections, anything less than 45 minutes is a bad idea—and you'll likely be better off doubling that amount of time and scheduling about 90 minutes between flights. For international flights connecting with domestic flights, add enough time to clear customs. How Far in Advance Should I Check In for a Flight? If you're checking in online, most airlines let you do so starting 24 hours in advance until one or two hours prior to departure. Benefits of checking in online include better seat selection (or higher seating-choice priority if you're flying Southwest) and not having to stand in line to check in at the airport. How Far In Advance Should I Get To The Airport? As a general rule, it's great to get to the airport two hours in advance of domestic flights and three hours before international flights. However, if you're looking to shave off a bit of your hurry-up-and-wait time at the gate, you can hone the equation for your specific situation. If you've checked in and printed your boarding pass before arriving, you've just saved yourself 20 minutes and can adjust your airport arrival time accordingly. Likewise, you've saved yourself a bit of time if you're only traveling with a carry-on and don't have to check bags. However, unless you're cleared for expedited screening (through Clear or TSA PreCheck at one of the participating airports), you'll need to budget plenty of time to get through airport security. Assume that security lines will be particularly slow during the peak airport-traffic hours of 6:30 to 9:30 in the morning, 11 a.m. to 2 p.m., and 3:30 to 7:30 p.m.
How Far in Advance Should I Be at the Departure Gate? Ever heard of a boarding-gate deadline? Most airlines have them, and they're important: If you don't make it to the gate within the allowed window, airlines don't have to let you on the flight. Boarding deadlines vary wildly based not only on the airline but also on the destination. For instance, on some Delta Shuttle flights, passengers need to be at the gate only five minutes prior to departure, but on Delta's international flights to Dublin and Istanbul, passengers must be at the gate an hour in advance. On many U.S. and Canadian airlines, passengers are expected to arrive at the gate about 15 minutes before departure for domestic flights and 30 minutes prior for international flights. However, since times do vary, check boarding-gate deadlines in advance so you don't cut it too close. 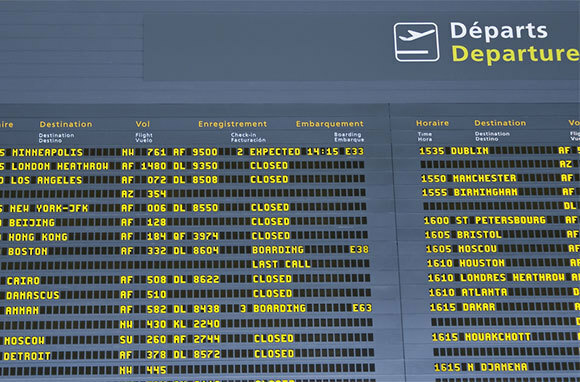 Airlines usually have a list of boarding-gate deadlines by airport and arrival city on their websites. How Far in Advance Should I Cancel a Hotel Reservation? If you're aiming for a full or partial refund, you'll need to follow your specific hotel's cancellation guidelines. Rules about how far in advance you need to cancel vary wildly among hotels. For instance, some small inns and bed-and-breakfast properties require you to cancel two weeks or more in advance to avoid cancellation fees, but some hotels require that you simply cancel before the check-in time on the day you're staying to be in the clear. Note that not all hotel chains have a uniform policy, though: Best Western, for example, has cancellation policies that vary by location. When Can I Check In And Check Out Of A Hotel? As with cancellation policies, hotels' check-in and checkout times vary by location. However, there are some similarities among lodgings, with check-in times starting mid-afternoon, usually around 3 p.m., and checkout times falling in the late morning, usually at 11 a.m. or noon. At many hotels, check-in and checkout times are far from set in stone. Loyalty members often get the option of early check-in or late checkout, and sometimes hotels offer the option with certain packages or room types. And if you've got a late flight or just need a home base for a few more hours, it never hurts to call the front desk and ask. Often, the hotel will be happy to oblige. If you arrive early and your room isn't ready, most hotels will store your luggage until you can check in (sometimes for an extra fee). And if you plan on arriving long after the check-in time, it's worth a quick phone call to alert the front desk of your estimated arrival time so they don't think you're a no-show and give away your room.